To ask other readers questions about Transcription, please sign up. What is the total number of people who had the urge, after about the 70% mark, to slap Miss Armstrong briskly with a large trout? What are your conclusions on the ending? Don't want to add spoilers yet. This answer contains spoilers… (view spoiler)[ The ending was terrible and a cheat to the reader. Finding out that Julia was a Communist went to everything Julia did, her core motivations. But…more The ending was terrible and a cheat to the reader. Finding out that Julia was a Communist went to everything Julia did, her core motivations. But Atkinson never explains it! There were no clues, you never see Julia do anything that would indicate she was a double agent. It's like finding out you were reading an entirely different book than you thought you were. It might have been more interesting if she'd actually included the double agent thing in the plot. As it was, almost nothing happened and it was super boring. Lynn Meinders I saw that same parallel in current day politics — nice to confirm I am not alone in this. I enjoyed this book and your review of it very much. Liz Lynn wrote: "I saw that same parallel in current day politics — nice to confirm I am not alone in this. I enjoyed this book and your review of it very Lynn wrote: "I saw that same parallel in current day politics — nice to confirm I am not alone in this. I enjoyed this book and your review of it very much." As this novel opens, it is 1981, Juliet Armstrong is 60 years old, and while she was distracted by her thoughts, she was struck by a car when she attempted to cross the street. Her story comes through in a series of jumps between 1940 and 1950 before landing back in 1981 again. In 1940 at the tender age of 18, Juliet is recruited by MI5 to work on transcribing taped conversations between one of MI5’s agents disguised as a subversive and several informants. There are short excerpts from these tran As this novel opens, it is 1981, Juliet Armstrong is 60 years old, and while she was distracted by her thoughts, she was struck by a car when she attempted to cross the street. Her story comes through in a series of jumps between 1940 and 1950 before landing back in 1981 again. In 1940 at the tender age of 18, Juliet is recruited by MI5 to work on transcribing taped conversations between one of MI5’s agents disguised as a subversive and several informants. There are short excerpts from these transcriptions throughout the 1940 portions of the novel. In 1950, the war is over, although the aftermath lingers. Especially in the world of MI5, where spying on whatever enemies exist continues. Juliet’s everyday life has changed, however. She is involved in the production of several radio programs for school children. However, as Juliet discovers, one is never entirely free of the spy business. Once a part of MI5, always a part of MI5. Maybe. Unless . . .
One of Juliet’s thoughts from 1981: The Russians had been their enemies and then they were their allies, and then they were enemies again. The Germans the same – the great enemy, the worst of all of them, and now they were our friends, one of the mainstays of Europe. It was all such a waste of breath. War and peace. Peace and war. It would go on forever without end. Of the many things I have always admired about Kate Atkinson’s writing, one in particular stands out: how brilliant it is. We experience first-hand the intelligence and rapid-fire brain synapses of Juliet Armstrong right from the beginning. Although she is resigned to always being the one expected to clean up, to get the tea, and other “female tasks” like typing up the transcripts, her mind is always working at the speed of light and she both sees and knows far more than she would ever let on. And people notice. The author’s notes at the end of this story are wonderful. Ms Atkinson describes where real situations and events from the war years are blended with the fictional story she is telling. It is virtually seamless, and if someone had said this is a true story, I wouldn’t question it for a moment. This is an ingeniously plotted story, and I felt instant kinship with Juliet Armstrong – even at the same time that I was bowled over by her intellect. Her relationships with her fellow co-workers and those in the hierarchy above her were fascinating and had me feeling by turns loftier and humbled. Although this is not what I would describe as a “funny book”, it was overflowing with humour and entertaining situations. I laughed out loud a few times, and I also felt sad a few times because there is also pathos here. Not all of Kate Atkinson’s novels have been what she calls historical fiction, but the last several have been. This novel may hew closest to the truth, though like she says in the Author’s Note at the end, she wrenched open history and stuffed it with imaginative reconstruction, at least one fantasy for each fact. The author tells us afterward what her intentions were: we have questions—that’s inevitable—and instead of farming out possible answers to various reviewers, she’s just blunt with us w Not all of Kate Atkinson’s novels have been what she calls historical fiction, but the last several have been. This novel may hew closest to the truth, though like she says in the Author’s Note at the end, she wrenched open history and stuffed it with imaginative reconstruction, at least one fantasy for each fact. The author tells us afterward what her intentions were: we have questions—that’s inevitable—and instead of farming out possible answers to various reviewers, she’s just blunt with us what we’d been wondering about. There is something comparable in theatre, when the actors takes off their masks for the final bow and we all celebrate together. By now Atkinson may be incapable now of writing a straightforward fiction with a chronological timeline. This novel has only three time periods to work with and really only one central character, which simplifies the action enough that I only had to reread an earlier section once. This was partly due to my surprise, maybe a little resentment, and finally pleasure at being taken out of the action at what seemed like a critical moment…again! She’d done that to me in the previous section as well. I was burrowed in like a tick, and am yanked to a later, earlier, whatever time. Atkinson manages to satisfy and confound a reader at the same time. Atkinson’s characters always have the ‘ghost of Jackson Brodie’ about them. This is a very good thing, considering how much we liked Brodie and wouldn’t mind having him resurrected. We could make the case that the main character in this novel, Juliet Armstrong, is a female Jackson Brodie—honest and therefore vulnerable, she doesn’t have so high an opinion of herself that she is insufferable. In the end she is well able to take care of herself. She’s smart, and a very good liar, but keeps herself a little distant. After all, who can one trust? Stacy Exactly how I felt! I am having a really bad historical fiction year (looking at you Washington Black). So I was absolutely convinced that dropping all my reading commitments to immediately pick up Kate Atkinson's new WWII spy novel would help raise my spirits. Her previous books Life after Life and A God in Ruins are favourites of mine. I trust her to a deliver a distinct kind of uber- British novel, complete with her rather sardonic humour and droll observations. All of these Atkinson-isms are here, at least in part, but the final result is, I am deeply sad to report, a bit of a mess. I am sure Atkinson knows wit is one of her trade marks but she totally over does it here, it loses it's charm. This starts out a very promising espionage novel that ends as farce. I don't recall her other novels being so peppered with asides in parenthesis not to mention the Greek chorus like repetition of text from earlier in the story. This technique not only drove me entirely batty it also succeeded in ousting me out of the story at key moments. An impressive amount of research has gone into this book, particularly the role of MI5 in monitoring Nazi sympathisers ( The Fifth Column) during WWII. I feel like the source material is rife with intrigue and danger but somehow that is not carried over into this story. Many times I considered that I might have been better served by reading a non-fiction account of this era. The sense of the war, the political machinations of MI5 and the various elements of seditious activity became quite lost in this rather curiously light-hearted plot. Was Atkinson trying to show that spy craft was relentlessly dull and often pointless ?. That all MI5 men are essentially interchangeable types and that it is impossible to tell who is spying on who and why ?. If so then this was a success. It hurts me to review this so unfavourably and other fans of Atkinson should not be disheartened as it is entirely possible that I was still suffering a Warlight hangover. The two books share some overlap in a setting of post-war London and espionage as a critical driver however in all other respects they could not be more stylistically opposed. Atkinson is one of my favorite authors and, with Transcription, she has moved her star even higher. The tale is set in England, primarily London, in 1940, 1950 and 1981. The pivotal events occur in 1940, when Juliet Armstrong at 18, is recruited for the war effort. But not for any battle-related job, no. She is to file and type. Soon she is recruited further as a transcriptionist for an MI5 developed cause, to reel in and control English Fifth Column citizens, those who sympathize with the Nazis Atkinson is one of my favorite authors and, with Transcription, she has moved her star even higher. The tale is set in England, primarily London, in 1940, 1950 and 1981. The pivotal events occur in 1940, when Juliet Armstrong at 18, is recruited for the war effort. But not for any battle-related job, no. She is to file and type. Soon she is recruited further as a transcriptionist for an MI5 developed cause, to reel in and control English Fifth Column citizens, those who sympathize with the Nazis. While the outline of the story may appear relatively simple, in Atkinson’s hands and with her wonderful verbal skills, the tale becomes one of identity in a much-changed world, reality vs multiple other possible realities, issues of truth or whether there is truth, and the ever present layers of deception in Juliet’s new world. As in other of her novels, there are questions of self and reality along the way, though tackled in a more concrete way than the last two novels. These are just some of my favorite lines/quotes scattered throughout the book. Come now, quite enough of exposition and explanation. We’re not approaching the end of a novel, Miss Armstrong. be attended by a bodyguard of lies. against each other in the greasy fug of Moretti’s. that there was no metaphor too ostentatious for grief. It was a terrible thing and demanded embellishment. I believe these samples give an idea of the spark behind the prose of this novel. Atkinson provides an interesting Author’s Note outlining the inspirations and sources used before imagination and artistic license took over. She also provides a bibliography relevant to the war years, MI5, etc. I wholeheartedly recommend this novel. PLease see full review on my blog. I wasn't a fan of Kate Atkinson's Life After Life and was hesitant to try this, but after seeing the praises I couldn't resist the temptation of asking the publisher for a copy. This is a book that will take you to 40's and 50's, it's quintessentially British in all levels. I haven't read a more satirical, sharp, enjoyable book that takes place in WW2 so far. This piece of history is clearly something Atkinson excels in, she takes us through the war-ridden London PLease see full review on my blog. This is a book that will take you to 40's and 50's, it's quintessentially British in all levels. I haven't read a more satirical, sharp, enjoyable book that takes place in WW2 so far. This piece of history is clearly something Atkinson excels in, she takes us through the war-ridden London with ease. The people, the events, the conversation, the characters in this book, all 5 stars and I found this book an absolute reading joy, can't recommend enough if you're fan of books that are related to : British, spies, WW2. The humour appropriately dry. The atmosphere noirish, just a bit, to add in enough grit and some patina of time that feels to have passed between the reader and the plotline origins. Just what I love to read occasionally. PS. Mangling Russian dishes didn't improve the novel. By 'Verushka' a 'vatrushka' probably was meant. Took me ages to guess. Why the hell couldn't the writer just call it a pie or a cheese pie or a Russian cheese pie? The book gained no extra authenticity whatsoever from making it sound as if they were all eating someone called Vera (Faith!) in an endearing form! I should have followed him, she thought. But he would have lost her. He had been rather good at evasion. (c) Wow. Lovely phrase, it could mean both physical and intellectual stuff. The Four Hundred, the Embassy, the Berkeley, the Milroy, the Astoria ballroom – there was no end to the entertainment to be had during a war. (c) I’ve a feeling I might know why Hitler went as far as he did, around the Europe. ‘Can I do something, sir?’ she asked. She didn’t feel she had the fortitude for all those Tudors, they were so relentlessly busy – all that bedding and beheading. And that was that. Juliet’s war. … Juliet seized her chance. It is always a pleasure to open a new book by Kate Atkinson. I know I am going to find something well written, totally absorbing and above all original. How she does it I do not know. In Transcription she takes us to 1940 World War 2 London, where we meet Juliet, an eighteen year old girl who has just been recruited by MI5. There is a lot more to this Juliet than meets the eye and she continued to surprise me right through to the end of the book. Atkinson writes splendid characters, especially the It is always a pleasure to open a new book by Kate Atkinson. I know I am going to find something well written, totally absorbing and above all original. How she does it I do not know. Atkinson writes splendid characters, especially the eccentric and bumbling upper class British. There is a lot of humour in their actions and in the dialogue. She is also able to create a sense of place and time to perfection. I felt as though I was living and breathing London along with Juliet, Perry (poor Perry!) and the rest. 'Intact?' She had to think for a moment what he meant by that. (She thought of the Latin. Untouched.) 'Oh,' she said eventually. 'Yes, sir.' She blushed all over again, dreadfully hot suddenly, despite the weather. It wasn't a question you asked if you weren't intending to do something about it, was it? Although in her imagination this act had involved dim lighting, satin sheets, perhaps flutes of champagne and a discreet veil drawn over the crude mechanics of the act, mainly because she still had little idea of what they were. Also, on a practical level she had imagined a bed, not a hillocky field beneath a thundery sky that was the color of putty. An uncomfortable tussock was sticking into her left buttock. She could see dark clouds moving in from the west and thought, 'we're going to get rained on.' Out of the corner of her eye she saw her hat blow away. 'Oh,' Juliet said again. ABOUT THIS BOOK: In 1940, eighteen-year old Juliet Armstrong is reluctantly recruited into the world of espionage. Sent to an obscure department of MI5 tasked with monitoring the comings and goings of British Fascist sympathizers, she discovers the work to be by turns both tedious and terrifying. But after the war has ended, she presumes the events of those years have been relegated to the past forever. MY THOUGHTS: If I could be any writer in the world, I would wish to be Kate Atkinson. I love her inconsequential thoughts, her irreverence, her wit. Her characters are so very real to me that I hesitate to close the book for fear of losing my new found friends (a hangover from my childhood). They have a depth and richness that is seldom seen, another trademark of Atkinson's writing, and yet they are very ordinary people, stumbling through their lives much like most of us do. Transcription is very much a character driven novel. If you are waiting for something to 'happen', you may well be very disappointed - after all, Juliet can't even lose her virginity - although, of course, things do happen; mundane, everyday things that a naive eighteen year old imbues with perhaps more (or less) significance than they merit. And underneath all the mind-numbing boredom of typing endless reports, in triplicate, of coping with carbon stained fingertips, of drinking endless cups of tea and the odd cocktail, there is slowly revealed a tale of espionage, counter-espionage, double agents, and a lot of people of whom we are never quite sure whose side they are on. And please do read the author's note. Transcription's origin is rooted in reality, and Atkinson talks about the documents that started her on this wonderful journey, and the people behind them. She has also provided me with a whole raft of new reading material that I would never otherwise have heard of. Thank you Kate. 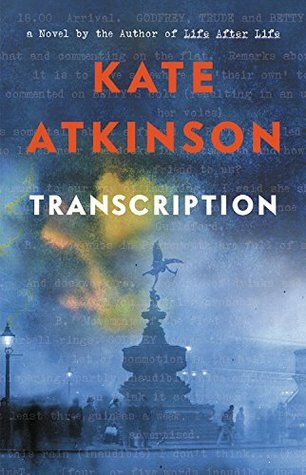 DISCLOSURE: I own my copy of Transcription by Kate Atkinson, published by Doubleday. All opinions expressed in this review are entirely my own personal opinions. Oh I had high hopes for this one. A Kate Atkinson spy novel set during World War II sounded like a winning formula to me. Indeed, the reviews of Transcription have been full of praise. But I reckon it is one of her lesser works, not reaching the heights of Life After Life or the majestic A God in Ruins. In 1941, Juliet Stephenson is 18 years old, naive and unsophisticated. Everything changes when she is recruited by MI5. Her new job consists of listening to the recorded conversations of Nazi symp Oh I had high hopes for this one. A Kate Atkinson spy novel set during World War II sounded like a winning formula to me. Indeed, the reviews of Transcription have been full of praise. But I reckon it is one of her lesser works, not reaching the heights of Life After Life or the majestic A God in Ruins. In 1941, Juliet Stephenson is 18 years old, naive and unsophisticated. Everything changes when she is recruited by MI5. Her new job consists of listening to the recorded conversations of Nazi sympathisers and transcribing them for her superiors. Gradually she becomes more involved in the spy world, taking part in some dangerous operations herself. Years later Juliet is working for the BBC when she starts to receive anonymous notes, saying "You will pay for what you did." Just what did she get up to during the war and is her past about to catch up with her? If you've only read a couple of Kate Atkinson novels, you may think she does just one thing. She doesn't. In fact, I tend to get a little miffed when she sticks with one thing for too long because I want to see her stretch out in every direction. When I started TRANSCRIPTION and realized we were back in WWII (major setting of her last two novels) I thought, "Nooooooooo not again," but I couldn't have been more wrong. This isn't a follow-up to LIFE AFTER LIFE or A GOD IN RUINS in any significant If you've only read a couple of Kate Atkinson novels, you may think she does just one thing. She doesn't. In fact, I tend to get a little miffed when she sticks with one thing for too long because I want to see her stretch out in every direction. When I started TRANSCRIPTION and realized we were back in WWII (major setting of her last two novels) I thought, "Nooooooooo not again," but I couldn't have been more wrong. This isn't a follow-up to LIFE AFTER LIFE or A GOD IN RUINS in any significant way. This, my friends, is a spy novel and a real juicy one at that. But it does have the one Atkinson trademark, where you finish it feeling like you've read a fancy literary novel while still indulging in real genre thrills. We start in 1950 where Juliet is moving towards spinsterhood with a rather dull job producing children's educational radio shows for the BBC. A chance encounter with someone from her past in MI5 sets off a long flashback to 1940. Juliet is barely an adult when she's brought in to do secretarial work for the government as so many women did during the war. She ends up, seemingly through sheer happenstance, taking on a covert job as a transcriptionist, listening in on a British spy who is undercover among German sympathizers. It starts out as dull work but soon Juliet is roped into taking on a larger role in the operation. For a while we move back and forth between these two times, learning more about what Juliet did for MI5 during the war and following her growing paranoia a decade later as she suspects that someone is after her for what she did back then. This isn't exactly a traditional thriller, though the tension is expertly managed, mostly by the way Atkinson toys with the reader. She can turn on a dime, and Juliet's wry outlook on the world provides a healthy helping of humor amid the growing suspense. It's not just a suspenseful spy novel, it's building a whole world for Juliet to live in, which makes the spy part work even better. When you can see all the little players everywhere, you start to wonder if all of them are who they say they are and just what there may be below the surface behind any face, any front door, any shop window. I loved this World War II British espionage thriller! In 1940, Juliet Armstrong is recruited by MI5 to transcribe recorded meetings between undercover MI5 agents and traitorous British citizens who are secretly spying for Germany. England is on the brink of war as Hitler’s forces consume Europe. Juliet is eventually drawn into active spy duty, playing a role as a young German sympathizer working in the War Office. Her job is to infiltrate the Right Club, a small group of antisemitic and fascist I loved this World War II British espionage thriller! In 1940, Juliet Armstrong is recruited by MI5 to transcribe recorded meetings between undercover MI5 agents and traitorous British citizens who are secretly spying for Germany. England is on the brink of war as Hitler’s forces consume Europe. Juliet is eventually drawn into active spy duty, playing a role as a young German sympathizer working in the War Office. Her job is to infiltrate the Right Club, a small group of antisemitic and fascist sympathizers within the British establishment. Infiltrate it she does - with unforeseen consequences that reverberate into the future. The book moves back and forth in time between 1940, 1950 and 1981. I loved the 1940 storyline the best - wonderful characters and a glimpse into wartime England. The 1950 storyline confused me a bit. I wasn’t sure what was real and what Juliet might be imagining. Encounters at a spy colleague’s former home and a yarn shop seemed surreal and unlikely. So many spies and double spies and traitors and suspicious characters milling around! Perplexing - but overall, a very atmospheric winner. Be sure to read the author’s note at the end for an explanation of how the story evolved and the intermarriage of fact and fiction in the story. In some of the reviews I read, readers stated that they felt no connection at all to the coolly cynical and diffident Juliet. I felt the opposite, I felt like I knew exactly who she was - hello, Jungian INTJ personality. I “got” you, girlfriend - I got you! Espionage would probably not make my top ten list of things to read about, or even my top 100 list for that matter, so I approached Transcription with a certain wariness. The fact that it is authored by Kate Atkinson was probably the only thing that motivated me to read it in the first place. The novel opens in 1981, “the year of a royal wedding,” with 60-year-old Juliet Armstrong falling down on a London street. Preoccupied with thoughts of her 26-year-old son and having lived abroad for many ye Espionage would probably not make my top ten list of things to read about, or even my top 100 list for that matter, so I approached Transcription with a certain wariness. The fact that it is authored by Kate Atkinson was probably the only thing that motivated me to read it in the first place. The novel opens in 1981, “the year of a royal wedding,” with 60-year-old Juliet Armstrong falling down on a London street. Preoccupied with thoughts of her 26-year-old son and having lived abroad for many years, she likely hadn’t looked in the right direction for traffic and has been hit by a car. After this, Juliet’s story shifts back 30, then 40, years. The 1950s segment also unfolds on a London street. Taking a lunch break from her job at the BBC, Juliet chances upon a man she’d known quite well during the war—a fellow spy, in fact—who now completely denies having been acquainted with her. The 1940s section, which is a great deal longer, explains (among other things) how Juliet first came to know that spy, Godfrey Toby, alias John Hazeldine. Early on, Atkinson gives us a little of her protagonist’s background. We learn Juliet was raised by a single, dressmaker mother, that she’d been a bright girl and a scholarship student of some promise, and that everything had changed for her at 17 when her mother died. Forced to shift for herself, Juliet went on to attend a second-rate secretarial school. With the outbreak of the Second World War, she hoped to be accepted by the ATS, the Auxiliary Territorial Service, the women's branch of the British Army. Instead, she is called to a strange interview, which she inexplicably lies her way through (even about apparently inconsequential matters, such as her favourite painter), and is signed on by the Security Service— MI5, Britain’s domestic counter-intelligence and security agency. She is soon selected by the famous Peregrine Gibbons for a special intelligence operation that is to unfold in Dolphin Square, a large block of private flats (in Pimlico) built in the mid 1930s, shortly before the time of the main action of this story. Juliet will eventually become a full-fledged spy herself. It’s quite a long time since I’ve read an Atkinson novel and I really don’t recall her writing being so fluffy and flippant. I found Juliet an annoyingly frivolous and lightweight protagonist for whom I could not summon up even minimal interest. I felt I was given entirely too many of her punning and sardonic asides, which quickly wore thin. There is also a glut of period details, which some may regard as producing a more authentic piece, but which I just felt bogged down by. One-third of the way through, I bailed. I was sick of Juliet. I didn’t care what became of her. I feel a certain sadness at leaving behind a once-favourite author, but I didn’t like A God in Ruins either. Something has changed, and it may be me. This book is a wonderful mix of spies, counterspies, life in wartime London and the inner workings of the BBC. It's written from the point of view of Juliet Armstong, an intelligent young woman who was recruited by the British Security Service when she was 18. After a while her chief task became the transcribing of secretly-taped conversations between an MI5 agent (posing as a member of the Gestapo) and some English Fifth Columnists who were eager to help the Nazi cause. After the war, Juliet wo This book is a wonderful mix of spies, counterspies, life in wartime London and the inner workings of the BBC. It's written from the point of view of Juliet Armstong, an intelligent young woman who was recruited by the British Security Service when she was 18. After a while her chief task became the transcribing of secretly-taped conversations between an MI5 agent (posing as a member of the Gestapo) and some English Fifth Columnists who were eager to help the Nazi cause. After the war, Juliet worked at the BBC, until her past caught up with her. The book was loosely based on historical records and there is a lengthy bibliography in the book for anyone who wants to read about the actual people and events. The beginning of the book was a little confusing because the author hopped around among several time periods. It became much easier to follow once the story settled into the 1940s. The characters were very convincing, with compelling personalities and secrets. They were also very good at their jobs. I haven't always liked this author's books, but I enjoyed this one very much. Kate Atkinson's new novel, Transcription, follows Juliet Armstrong as she works in an obscure MI-5 department during World War 2 that monitors and records the activities of a pro-German group. While the work is initially boring and monotonous, an event occurs that drastically alters the department's work and Juliet's job. Fast forward a decade later, and Juliet is now working for a BBC radio station believing that her past is long behind her. However, as Juliet soon learns, actions almost always have consequences whether the effect is immediate or doesn't surface until a decade or more later. Atkinson's writing is simply beautiful; her sense of humor is dry and very witty. Juliet has a running commentary in her head that is filled with clever quips and asides. I found myself marveling at the author's ability to tell her story in such a fabulous way. Atkinson also touches on some timely topics such as nationalism versus patriotism and the threat of those who will sacrifice everything for a belief. Uugh, I haven't felt so tortured and bored by by book since I tried to read Hausfrau. 9731 ratings and 4113 are 3 stars or less. Halfway through I had to look through them for some closure and encouragement to let this one go. My day is about to get better. Judy Mann About 70 pages in and I have NOT A CLUE what is going on.Going to give up in about 6 pages. You're right.it's a mess. Kathleen Judy wrote: "About 70 pages in and I have NOT A CLUE what is going on.Going to give up in about 6 pages. You're right.it's a mess." Sorry you found it Judy wrote: "About 70 pages in and I have NOT A CLUE what is going on.Going to give up in about 6 pages. You're right.it's a mess." I am a huge fan of Kate Atkinson’s wonderful storytelling and for me Transcription was a pure joy from the moment I started it until the moment I reluctantly set it aside. The writing is genuinely superb, beautifully done and I adored Juliet, her manner, her acerbic inner dialogue and her highly intriguing yet strangely genteel existence. The setting and the time brought to utterly vivid life, we follow Juliet as she becomes part of the war effort, gets entangled in intrigue and faces unknowable c I am a huge fan of Kate Atkinson’s wonderful storytelling and for me Transcription was a pure joy from the moment I started it until the moment I reluctantly set it aside. The setting and the time brought to utterly vivid life, we follow Juliet as she becomes part of the war effort, gets entangled in intrigue and faces unknowable consequences years later. The pace is sedate yet entirely compelling, Juliet is incredibly engaging and the lines between fact and fiction blur into one addictively riveting tale. Transcription is a literary delight, a tranquil pond in the middle of a storm, often unexpected, emotionally resonant and pitched perfectly throughout. I loved it, the ending had me teary eyed and this is one of those books where I know I will miss those fictional yet honestly authentic characters for months to come. I was immediate swept away listening to this book on audio. Kate Atkinson’s writing transports me into another world and I have the utmost respect and admiration for her as a writer. Transcription has a narrower focus than many of her novels but weaves together so many themes. It also had some of her funniest lines and I often found myself laughing aloud (not something one generally experiences while reading a book set during war time) Juliet was an interesting narrator, very real and believabl I was immediate swept away listening to this book on audio. Kate Atkinson’s writing transports me into another world and I have the utmost respect and admiration for her as a writer. Transcription has a narrower focus than many of her novels but weaves together so many themes. It also had some of her funniest lines and I often found myself laughing aloud (not something one generally experiences while reading a book set during war time) Juliet was an interesting narrator, very real and believable. I loved her frequent literary allusions and honestly think Atkinson was channeling her inner PG Wodehouse at times. Atkinson’s themes of identity, spying, and the challenges of moving on in the years after the war also made me think of Michael Ondaatje’s new book War Light which recently read (also on audiobook). Similar structure of being first person narration and spread out over separate time periods. War Light though begins in the years immediately after the war and tries to piece together the mysterious lives of people during the war. Hauntingly beautiful - with similar dissonance between what was perceived and the layers of unanswered questions about the people one was close to. The two books would make an excellent shared reading for discussion. A low key, at times almost boring spy novel. I seem to be incapable of not liking a Kate Atkinson book though. I love her books for their immersive historical background, humor and vividness of characters. “Who spies on the spies...?” I love a good spy novel and this one was a good one, even if it did have a bit of a slow start. Juliet Armstrong, a young woman with no family, finds herself recruited into M15, the UK’s domestic counter-intelligence and security agency. Beginning in the boring atmosphere of filing and secretarial work, she is soon moved to an apartment building where her job is to listen to recorded tapes and transcribe the dialog into reports. Eventually Juliet is sent out into the f “Who spies on the spies...?” I love a good spy novel and this one was a good one, even if it did have a bit of a slow start. Eventually Juliet is sent out into the field posing as another person in order to infiltrate an organized ring of traitors and Hitler sympathizers. It’s at this point where the story really gained some momentum. We hear Juliet’s story from the time frames of 1940, 1950 and 1980. Other characters weave in and out of her life and soon it’s obvious that it’s not a good idea to trust that anyone is who they say they are. It was a nice change to read a WWII novel that did not have anything to do with the concentration camps. I also liked the idea of having an inside look into the world of spying and double agents.